Updated A 19-year-old computer science student has been named the UK's Cyber Security Champion following months of competition. Jonathan Millican emerged victorious from finals held over the weekend at the end of a six-month challenge designed to get talented people to consider a career in cyber-security. The final showdown (Masterclass) in the Hack Idol exercise pitted six five-strong teams against each other in a series of challenges hosted by HP Labs in Bristol on Saturday. Exercises included advising a start-up on cyber security during a role-playing exercise and fending off a 50-minute-long simulated cyber attack. The simulated attack involved port scans, followed by attacks on a vulnerable webserver, defacement, mail spam, a DDoS and an attempt to extract data. The teams were challenged to try to stop these attacks in real time by changing IDS, firewall and router configurations. Millican's team finished in second spot but he caught the judges' eye as the most talented of the 30 participants, earning him the coveted overall title. 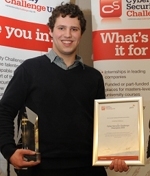 Millican – a first year student University of Cambridge originally from North Yorkshire – has been offered sponsorship for a masters degree at Royal Holloway, University of London as a prize. The undergraduate is at an early stage of his degree and is yet to take any computer security modules. He has yet to decide what he wants to do but the "experience of the challenge will make look a lot more seriously into going into computer security," he told El Reg. Millican, whose only practical experience involved setting up and playing around with a home network, demonstrated innate ability by tackling realistic challenges that simulated the business and practical side of managing enterprise security. Russ Taylor, a technician in the RAF, was the runner up. Representatives of sponsors – HP, management consultants PricewaterhouseCoopers, BT, and defence firms Cassidian and QinetiQ - judged the competition. This year was the second year that the Cyber Security Challenge was held. Last year's event was won by Dan Summers, a postman from Leeds, who has gone on to work for Royal Mail's cyber-security team. Organisers plan to run the competition again next year in a slightly revamped form that will provide the first opportunity for professionals within the industry to pits their wits against new bloods. Established professionals will not be eligible for prizes and will be charged a fee, which will be used to help fund the ongoing work of the Cyber Security Challenge. There's also plans to run a four-day cyber camp for younger candidates in the 18 to 25 age group, with 30 places, possibly hosted by Lancaster University, though nothing has been confirmed on this front. Judy Baker, director of the Cyber Security Challenge, said that 60 per cent of this year's applications came from the over-25 group. She said the organisation was keen to encourage more young people to consider a career in cyber security as well as encouraging those already in the workplace to consider a change in job.